A Rock 'n' roll Workhorse! Get ready to rock with the Sterling by Music Man AX40D solidbody electric guitar! THe AX40D sports a fast and smooth maple neck with a toneful basswood body topped with a quilt maple veneer. A pair of Music Man DiMarzio AXIS pickups delivers the hot tones needed for hard-rocking gigs. A licensed double-locking tremolo lets you divebomb and warble the night away while staying in tune. If you're looking for an affordable guitar with the feel of a much more expensive instrument, then the Sterling by Music Man AX40D is the axe for you! 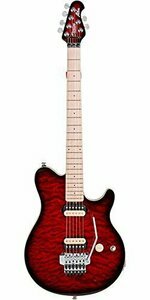 The Sterling by Music Man AX40D electric guitar sports the classic look of the Music Man Axis that was originally the Van Halen signature model guitar. Not only does it looks like it, it also feels and sound like it thanks to Music Man's proprietary DiMarzio AXIS pickups. The licensed double-locking tremolo is blocked, just like the original, so it only lower the pitch of the strings. You won't believe how good the Sterling by Music Man AX40D plays and feels. Call your Sweetwater Sales Engineer and order yours today! Not only does the Sterling by Music Man have a great feel and vibe, it is also loaded with name-brand DiMarzio pickups. You get the same exact Dimarzio pickups that Music Man puts in the Axis guitar line in the AX40D! You'll never need to change out these pickups, they deliver all the rock-ready tones and firepower you could ever want. These pickups have only been available in the Axis, until now. The Sterling by Music Man AX40D is a guitar player's dream come true! 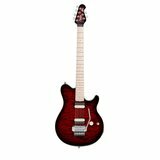 Sterling by Music Man brings you the the quality you expect in a Music Man guitar at an musician-friendly price. 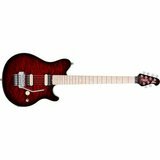 Sterling offers authentic and accurate versions of many of the Music Man guitar and bass models including the Axis, John Petrucci signature models, StingRay, and more. Music Man's head luthier Dudley Gimpel worked to ensure that these guitars and basses are as close to the originals as possible. You'll be amazed at the value, feel, and playability of Sterling by Music Man.